PLACENTIA, CA – In June, Dogfish Head Founder Sam Calagione traveled to Southern California for a special collaboration brew with The Bruery. The beer, brewed with the intention of raising money for victims of the earthquake in Japan, has quite the name. Faster, Bigger, Better, Bolder (Gradually, Quietly, Steadily) is an homage to the contrasting lifestyle views of American excess set against the more humble and traditional ways of Japan. 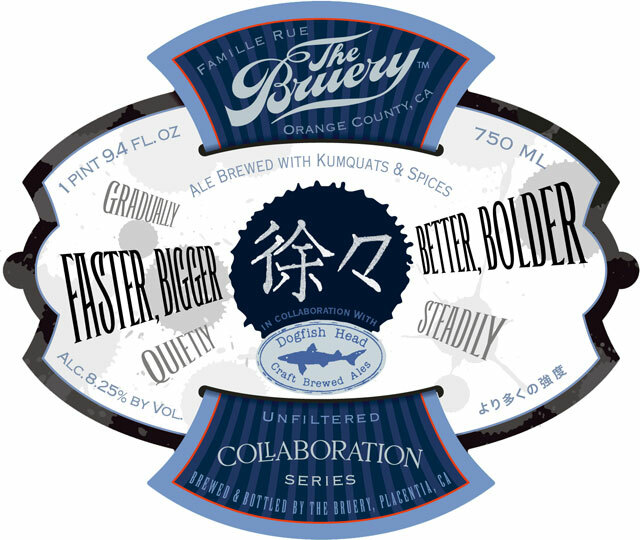 This limited edition beer is brewed with kumquats and The Bruery’s own seven spice schichimi togarashi blend along with sake yeast. Benjamin Weiss, Manager of Sales & Marketing with The Bruery confirmed today that only 10,000 bottles of the special brew were made. The beer could be released at the end of this month, but Weiss said they may hold off until early October. The ale, which falls way outside any traditional style categories, will be bottled in the traditional 750 ML packaging the Bruery has become famous for, and will be sent across the national distribution channels that normally receive limited-edition Bruery beers. Weiss also confirmed that the suggested retail price would be in line with many of their other fall and seasonal offerings.